Good hooves help horses live active, healthy lives into advanced old age, and so it is to wonder that hoof care is a top priority at The Horse Trust's Home of Rest for Horses, which caters for the retirement needs of over 100 horses, donkeys and ponies. 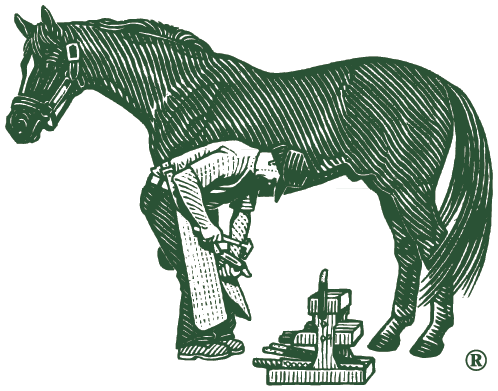 For the past 12 months, staff at The Horse Trust in England's Chiltern Hills have been using Farrier's Formula® Double Concentrate, a supplement designed to strengthen the hoof, improve the coat and ensure healthy connective tissue, on selected elderly horses with problem feet. Tessa is a good example. The 14.1hh grey mare is 32 years old and has been at the Home of Rest for Horses since 1999. "Tessa's generally fit and well, but she's had problems with seedy toe for the last three years," says the Trust's Chief Executive, Jeanette Allen. Seedy toe, also known as white line disease, is characterised by a separation of the inner zone of the hoof wall, resulting in a cavity which fills with crumbling horn and dirt and often leads to infection. "Since being on Farrier's Formula® Double Concentrate, there's been a big improvement in the condition of Tessa's hooves," she adds. The Farrier's Formula® Double Concentrate trial was begun by outgoing CEO, Brigadier Dr. Paul Jepson, who remains with The Horse Trust as a specialist policy consultant. "The horses were selected on the basis of poor quality horn and minimal hoof growth rate," he explains. "They're all retired residents of The Home of Rest for Horses and vary enormously in size, breed and conformation. "Without exception, there's been a noticeable improvement not only in their hoof growth and quality but also in their coats and maintenance of bodyweight, which can be problematic in old horses." "The Trust's work goes way beyond caring for the horses at its sanctuary. It's become the largest provider of equine welfare and horse research grants in the UK, and so it's a privilege for us to be able to help a little in return." The oldest horse charity in the world, The Horse Trust was originally established in 1886 to help the working horses of London. Today it is dedicated to the welfare of the horse worldwide, to scientific research, to the education of horse owners, riders and trainers and to the continuing care of the horses at its sanctuary. The Trust depends on donations to fund its work and also relies on volunteers to help out both in the yard and in its offices. As a result of the current financial crisis, it is more in need of donations than ever. Reduced income has forced a suspension of its new grant programme, meaning that urgent research cannot be funded.